Apple is hiring a 'Maps Public Transit Engineering Manager' and 'Maps C++ Software Engineer - Public Transit' to help it finally update the iOS Maps app with transit directions. 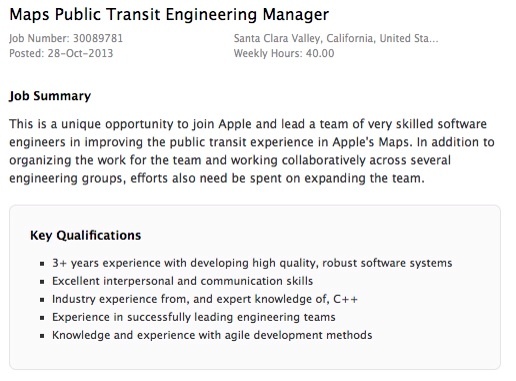 The manager job summary describes the position as "a unique opportunity to join Apple and lead a team of very skilled software engineers in improving the public transit experience in Apple's Maps. In addition to organizing the work for the team and working collaboratively across several engineering groups, efforts also need be spent on expanding the team." As a software engineering manger you will act as a role model for the team by organizing the work, contributing by writing and reviewing source code, and establishing strong relationships with other teams. Organizing the work includes thinking ahead and identifying requirements, providing time estimates for implementations, and making sure the team meets the agreed deadlines. It also involves ensuring that the overall architecture is scalable in order to handle the ever-increasing number of users. It is, of course, important to coach the team members, be on top of the day-to-day work, and helping to resolve any impediments. Part of the work is also to actively contribute with software architecture, design and implementation of production code, as well as reviewing the work of others. To succeed in this role, it is important to have the ability to come up with innovative solutions to hard problems by using both domain specific knowledge and outstanding engineering skills. In order to relate to the service a strong interest and/or deep knowledge of public transit is required. Notably, Apple was recently hiring a 'Web UI Designer - Maps' to work on 'a new secret project'. The company has also acquired a string of location and mapping based companies that will likely be used to bring transit directions and other improvements to its Maps app.